A type of loan where you borrow a small amount of money for a very short period of time at a very high interest rate is payday loan. A type of loan where you borrow a small amount of money for a very short period of time at a very high interest rate is payday loan. Most borrowers who use payday loans have bad credit and low incomes. It’s quite possible that people using payday loans have a lot of debt on their credit cards and have hardly any options other than using the service of a payday loan company. A payday loan consolidation is a process where you have to take help from a company to negotiate the payday loan debt directly with the lender to reduce the interest rate of the debt taken. This process can take anytime from 2-4 years. 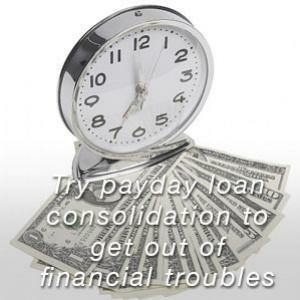 When you use payday loan consolidation program, your loans will be consolidated into a single manageable payment. The purpose is to negotiate with your creditors and reduce the interest rates or waive off late fees so that you're able to manage your debts better. 1. Single payment: The process of payday loan consolidation simplifies the process of getting out of debt. You just have to make a single payment every month. With that payment, all your bills will be paid off on time every month by the payday loan consolidation company. All your payday loans can be consolidated together. 2. Predetermined time: You get know the approximate time you’ll be free from debts. When you actually get into debt, you start living paycheck to paycheck and you don’t know when will this financial hassle get over. After taking up payday loan consolidation, you actually have a date to look forward to. You obviously have to pay a monthly installment amount, but ultimately there will be an end to it. 3. Reduced interest rates: When you undertake payday loan consolidation, your debt amount is most probably negotiated for a fixed installment repayment scheme. Not only this, many companies negotiate with the payday lenders to eliminate the late fees and reduce the rate of interest. Hence, it obviously results in reduced rates in payday loans. 4. Freedom from harassment calls: You’ll be free of the harassing collection calls from the creditor or the collectors. This will, in turn, reduce your stress level. When the lenders understand your situation and they know that you’re finding a way to pay your loans back with the help from a consolidation company, they are less likely to contact you. 5. Credit score improves: When you actually pay off an account, it has a positive impact on your credit score. You credit score and the ratings are very important and should be taken care of carefully. If your payday loans are unpaid for a very long duration, your credit score will no doubt get affected. So, it’s better to take an important step before it gets too late. Payday loans help to pay off your debts quickly, hence, having improving your credit score. 6. Stay in budget: After you take up payday loan consolidation, you don’t have to worry about your debts every month. You have a fixed amount allotted to the consolidation company, hence you know that your debts are getting paid. You have a fixed expense for a month so it’s easy to budget and plan your other expenditures accordingly. Payday loan consolidation does help you in all these things but at the same time you’ve to careful while opting for it. Shop around: You must shop around before finalizing a consolidation company. There are a lot of fraud companies so take care that you don’t fall into their trap. You can consult your friends and family in regard to this. You shouldn’t choose a less-recognized consolidation company for safety. Visit the company’s website to check BBB accreditation. Don't miss your payments: After finalizing the company, when your repayment plan is negotiated, don’t miss your payments. It’s really important to pay on time. Payday loan consolidation isn’t beneficial until you finish your payments without missing any. It might lead to further financial troubles. Payday loan consolidation makes your financial life trouble free but you must be cautious enough to take the responsibility of repayments.